Lewis Allen (A Bullet for Joey, The Uninvited) directed this classic film noir in Technicolor, starring Lizabeth Scott (Pitfall), Burt Lancaster (I Walk Alone), John Hodiak (Lifeboat), Mary Astor (The Maltese Falcon) and Wendell Corey (Harriet Craig). Eddie Bendix (Hodiak) and his henchman, Johnny Ryan (Corey), two gangsters in the gambling trade, return to a small desert town outside of Reno. Years ago, Eddie had left town under suspicion of murdering his wife and after running into some trouble in Las Vegas, Eddie now hopes to get involved with the local gambling house whose proprietor is his ex-flame Fritzi Haller (Astor). To complicate matters, Eddie falls for Fritzi's daughter (Scott), who used to be involved with the local lawman Tom Hanson (Lancaster), who's still in love with her. 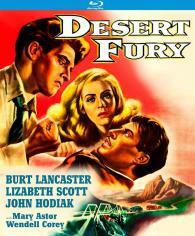 Desert Fury was adapted for the screen by filmmaker Robert Rossen (The Strange Love of Martha Ivers) from the far racier and more explicit novel by Ramona Stewart (The Possession of Joel Delaney).